The following descriptions will give you an idea of just some of the materials that are used to incorporate reading readiness, math and science into our curriculum. Our pre-k classroom is now using the Pearson/Scott Foresman Reading Street program for our reading curriculum. This program is a scientifically researched program that supports California’s standards in literacy and also touches on science, mathematics, social studies, art, and music. It includes children’s books, flip charts, alphabet charts, picture cards, song books, puppets, pre-decodable booklets, and vocabulary cards. This program supports our philosophy of emergent curriculum and learning through play, as well as allowing room for “teachable moments” that are so important when working with young children. The Hebrew Academy uses the Pearson/Scott Foresman program throughout the school. Our use of this program will help bridge the gap into kindergarten for children and families by providing an opportunity for consistency in their educational continuum. This curriculum complements our philosophy, which will enable us to use Reading Street to its fullest and will add to the quality we already provide in getting children ready for kindergarten. *Keep track of the number of days school has been in session by using number chart and ONES, TENS, HUNDREDS cups. 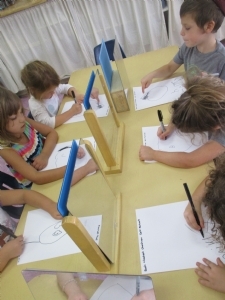 This activity introduces the children to the concept of regrouping. *Colors (beginning with the primary colors, RED, BLUE, YELLOW and then mixing these to discovery the colors, GREEN, PURPLE, ORANGE, PINK, BROWN, BLACK, WHITE and GRAY. Each morning, we will do a “group writing” during circle time. This will start as one or two sentences at the beginning of the year and expand to a paragraph as the year progresses. The children will be introduced to upper and lower case letters and punctuation marks. Contractions, compound words, and proper names are some of the terms that they will hear from time to time. These daily writings might have something to do with a story we have read or a special activity that has taken place or will be taking place that day. It is very important to expose the children to a variety of print and reading materials. This is just one way of doing that. A writing center is also available for them, which is filled with a variety of writing materials for them to use as they choose. At this young age, I encourage them to “write” any way they choose. It’s important for them to understand that “kid writing” (scribbles or pictures) is perfectly fine. At times, they may write a story in “kid writing” and “read” it back to me to write in “grown-up” writing for them. It’s important that we encourage them to get their thoughts and ideas down on paper any way they can. We want them to feel comfortable “writing” stories. In addition to these areas of learning, our classroom has a variety of games and manipulatives available for the children. Our library corner, dress-up/housekeeping area, and art easel (which are both in their Hebrew classroom) are also provided to enrich your child’s creative learning experience. Included in our program at no additional fee: Swimming, Art, Computers, Dance, and Music. These classes are weekly and with specialty teachers. As you can see, we have a year filled with many new and exciting experiences. We look forward to working with you and your child to help provide them with a fun learning experience in a warm, loving, and safe environment.